Replace that rusty front fuel tank cross member with our new weld or bolt in piece. Direct replacement for original. Has mounting positions for diff vent tube and fuel filter as original factory. Extremely heavy duty!! Comes with positioning brackets for a correct fit. Available for both 2 and 4 door applications. These flares come as kits which include all four or six flares depending on your model. Come complete with mounting hardware. Provides 3" of extra tire coverage! Made from ABS plastic, strong yet flexible and do not require the fuel door to be modified. Premium Soft Top Replacement for your 1989-1994 Tracker/Sidekick. Prices range from $400.00 - $750.00 depending on condition. 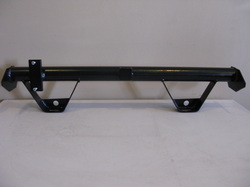 "A" frame style tow bar. Most economical and the simplest way to flat tow your Tracker/Sidekick.